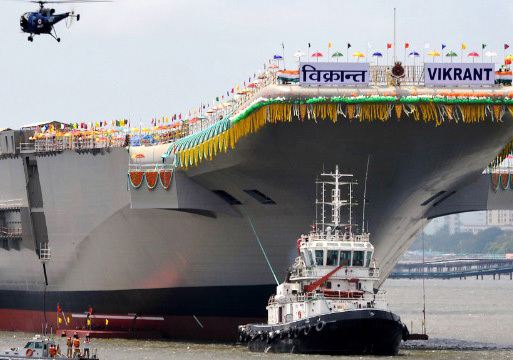 The carrier INS Vikrant, meaning courageous, is a 37,500-ton aircraft carrier unveiled at a shipyard in Kochi in southern India. The warship, built in India, will undergo extensive tests in the next few years before it is commissioned into the navy. The vessel can carry MiG 29K fighters and light combat aircraft. Previously, only the United States, the United Kingdom, Russia and France have had the capability to design and build such warships, Kar said.